Philanthropist Paul G. Allen announced today that he and the Paul G. Allen Family Foundation will ship more than 10,000 specially programmed smartphones to West Africa to enhance data collection and identify aid needs. Additionally, Mr. Allen is providing a grant to NetHope to further connectivity throughout Liberia, Guinea and Sierra Leone. This initiative is part of Mr. Allen’s $100 million commitment to tackle the Ebola crisis. 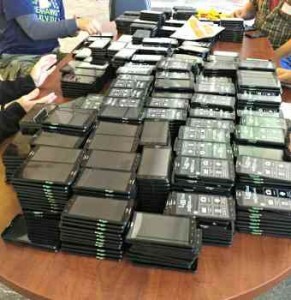 The smartphones will enable government workers and humanitarian aid volunteers to gather reliable data about the effectiveness of relief efforts in affected areas. The technology utilized by the phones is UW CSE’s Open Data Kit, an open-source toolkit for building data collection applications on smartphones and uploading the data to the cloud for analysis. ODK is widely used throughout the world for data collection for global health and other applications. The Vulcan team that designed and implemented the ODK-based solution interacted with UW CSE Ph.D. alums (and ODK development team members) Carl Hartung and Yaw Anokwa, whose startup Nafundi works in this space. Read more about Mr. Allen’s initiative here. Learn about ODK here. Learn about Change, UW’s cross-campus collaboration on information technology for the developing world, here.